PERFECTLY SITUATED BRICK ESTATE with BASEMENT and 3+ CAR GARAGE on 2.89 acres with extraordinary curb appeal! Unbelievable "STAYCATION" backyard retreat. Only a short walk to the Woodcreek waterslide pool! Meticulously maintained home featuring a rocking chair front porch, OPEN FLOOR PLAN with family room wall of windows, updated kitchen with granite island, breakfast bar & hardwood floors. GUEST ROOM/FULL BATH ON MAIN. Large master with renovated ensuite, huge tile shower and heated floors. Spacious loft area is perfect rec room/office . Icynene attic insulation. Walkout basement READY TO FINISH. Flagstone patio, French country stone fireplace, masonry smoker, hot tub, putting green, fenced yard! 100+ miles of cart paths, top rated schools and amenities! 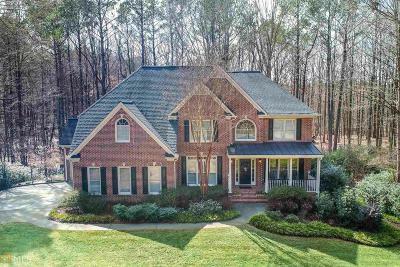 Directions: From Peachtree City Go South On Peachtree Parkway, Take A Right On Redwine, Take A Left On Second Woodcreek Entrance ( Woodcreek Lane) And House Is On Right #195 Woodcreek Lane. Please Note: Clubhouse/Waterslide Pool, Amenities As You Drive In.